HYDROMETH® is a MUST HAVE if you train insane! The Ultimate 5 Compound Mass Stack. Pharmaceutical Grade Raws – Tested 99% Pure. One of the fiercest SARM combinations we can offer, this 5 SARM stack puts the ‘Kong’ in King Kong and makes you swole as a full-grown Silverback Gorilla. Don’t be mistaken – this powerhouse of a stack will make you huge. After the first cycle KONG will get you dominating the weights and crushing PR’s left and right like it’s your job. Formulated by the reputable team at Medfit RX, KONG features five of the most potent SARMS you can find on the market – Cardarine, Ostarine, Nutrobal, LGD and Testolone. RARE LOOT DISCOVERED. All bottles now 60% Off! 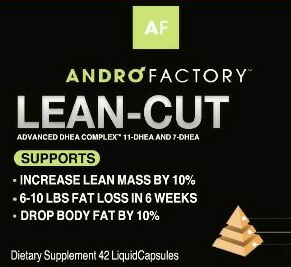 We finally got our hands on it…ANDRO FACTORY’s LEAN-CUT is the original fat shredding BEAST that contains real 11-KETO DHEA and 7-DHEA. Both have minimal androgenic and estrogenic activity all synergistically balanced with ANDRO FACTORY’s signature CP+R. Androsta-3,5-diene-7,17-dione (Androsta) is a metabolite of 7-Keto-DHEA, which is a very potent suicide aromatase inhibitor. It is a natural occurring compound, produced by metabolism of the prohormone DHEA, and it’s used in a wide array of supplemental stacks. It is so powerful that even the World Anti-doping Agency (WADA) has it on its banned list of anabolic agents, meaning Olympians will fail a drug test if it shows up in the blood. We know how it is, the alarm went off, you are awake but don’t dare come out from under the warm covers. Once that crisp air hits your skin, you’re toast! So get toasty with our cinnamon loaded nutmeg filled medium roast take on a fall classic. This blend will help you kick some tush on these chilly autumn mornings! So go ahead stay under the covers an extra minute; we’ve put your protein in your coffee so you don’t have to make a shake! This blend was created specifically for your perfect breakfast cup of coffee. Its just the “jolt” you need to get going in the morning! This is a medium-bodied blend of light and dark beans with a hint of acidity, tartness and infused with GENEPRO Medical Grade Protein! NSI-189 is an antidepressant and neurogenic chemical that may be able to improve cognitive function, treat traumatic brain injury,Alzheimer’s Disease (AD), Post-Traumatic Stress Disorder(PTSD), and stroke, and prevent cognitive and memory decline in aging.